It seems a lot of the space stories of this year involve spacecraft making journeys: bouncing across a comet, or making their way to Mars. Private companies also figure prominently, both in terms of successes and prominent failures. These are Universe Today’s picks for the top space stories of the year. Disagree? Think we forgot something? Let us know in the comments. This month saw the end of Venus Express’ eight-year mission at the planet, which happened after the spacecraft made a daring plunge into part of the atmosphere to learn more about its properties. 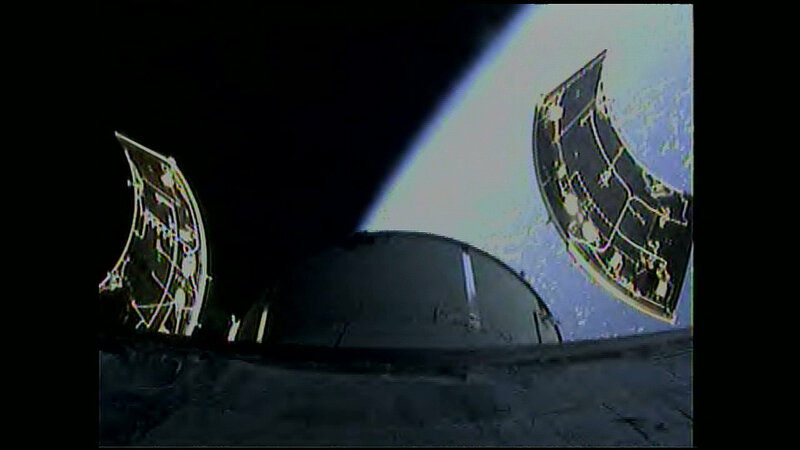 The spacecraft survived the aerobraking maneuvers, but ran out of fuel after a few engine burns to raise it higher. Soon it will plunge into the atmosphere for good. But it was a productive mission overall, with discoveries ranging from a slowing rotation to mysterious “glories”. Methane? Organics? Water? Mars appears to have had these substances in abundance over its history. Continued work from the Curiosity rover — passing its second Earth year on Mars — found methane fluctuating in Gale Crater, and the first confirmed discovery of organics on the Martian surface. Opportunity is almost 11 years into its mission and battling memory problems, but the rover is still on the move (passing 41 kilometers) to an area that could be full of clay. 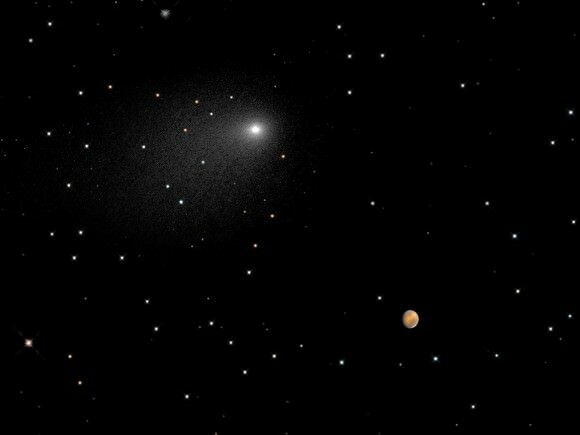 We had a rare opportunity to watch a comet make a grazing pass by Mars, not close enough to pose significant danger to spacecraft, but definitely close enough to affect its atmosphere! Siding Spring caught everyone’s attention throughout the year, and did not disappoint. 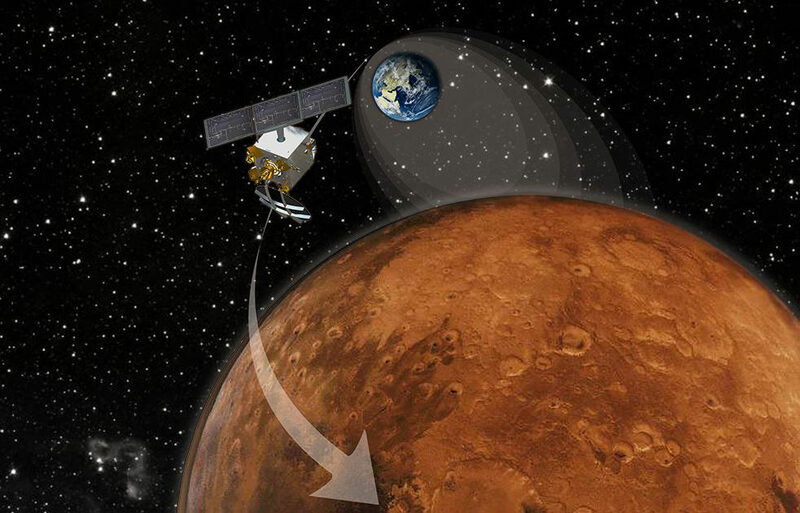 The numerous spacecraft at the Red Planet caught glimpses, including from the surface and from orbit. It likely created a meteor shower and could alter the Martian atmosphere forever. The Kepler space telescope lost the second of its four pointing devices last year, requiring a major rethink for the veteran planet hunter. The solution was a new mission called K2 that uses the pressure of the Sun to maintain the spacecraft’s direction, although it has to flip every 83 days or so to a new location to avoid the star’s glare. It’s not as precise as before, but with the mission approved we now know for sure K2 can locate exoplanets. The first confirmed one is a super-Earth. Where did the Martian atmosphere go? Why was it so thick in the past, allowing water to flow on the surface, and so thin right now? The prevailing theory is that the Sun’s pressure on the Martian atmosphere pushed lighter isotopes (such as that of hydrogen) away from the planet, leaving heavier isotopes behind. NASA is now investigating this in more detail with MAVEN (Mars Atmosphere and Volatile Evolution), which arrived at the planet this fall. India made history this year as only the third entity to successfully reach the Red Planet (after the United States and Europe). While updates from the Mars Orbiter Mission have been slow in recent weeks, we know for sure that it observed Siding Spring at Mars and it has been diligently taking pictures of the Red Planet, such as this one of the Solar System’s largest volcano and a huge canyon on Mars. In one sobering week in October, the dangers of space travel were again made clear after incidents affected Virgin Galactic and Orbital Sciences. Virgin lost a pilot and seriously injured another when something went seriously awry during a flight test. Investigators have so far determined that the re-entry system turned on prematurely, but more details are being determined. Orbital meanwhile suffered the catastrophic loss of one of its Antares rockets, perhaps due to Soviet-era-designed engines, but the company is looking at other ways to fulfill its NASA contractual obligations to send cargo to the International Space Station. SpaceX is attempting a daunting technological feat, which is bringing back its rocket first stages for re-use. The company is hoping that this will cut down on the costs of launch in the long term, but this technological innovation will take some time. The Falcon 9 rocket stage that made it back to the ocean in July was deemed a success, although the force of the landing broke it apart. Next, SpaceX is trying to place its rocket on an ocean platform. NASA’s spacecraft for deep space exploration (Orion) successfully finished its first major uncrewed test this month, when it rode into orbit, made a high-speed re-entry and successfully splashed down in the ocean. But it’s going to be a while before Orion flies again, likely in 2017 or even 2018. NASA hopes to put a crew on this spacecraft type in the 2020s, potentially for trips to the Moon, an asteroid or (more distantly) Mars. It’s been an exciting year for the Rosetta mission. First it woke up from a lengthy hibernation, then it discovered that Comet 67P/Churyumov-Gerasimenko looks a bit like a rubber duckie, and then it got up close and released the Philae lander. The soft touchdown did not go as planned, to say the least, as the spacecraft bounced for two hours and then came to rest in a spot without a lot of sunlight. While Philae hibernates and controllers hope it wakes up again in a few months, however, science results are already showing intriguing things. For example, water delivered to Earth likely came mostly from other sources than comets. In a press conference at the Mojave Air and Sport Port Sunday evening, acting NTSB Chairman Christopher Hart revealed preliminary findings in the investigation of the Virgin Galactic SpaceShipTwo test flight accident. According to Hart, review of cockpit video during the flight showed that the co-pilot Michael Alsbury turned the tail feathering lock-unlock lever to the unlocked position too early. But Hart was quick to add that the NTSB has not concluded that this represents a cause and effect, and more analysis is necessary. Feathering of the tail is an action taken during re-entry at high altitude in order to increase drag and accelerate the space vehicle’s descent. 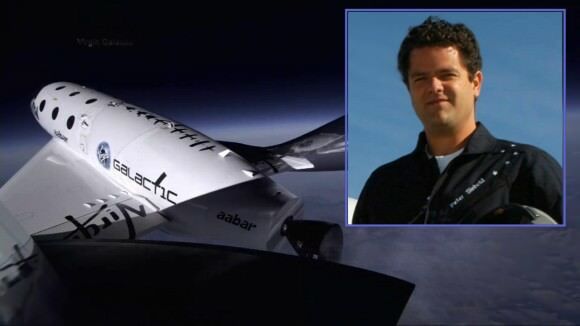 The apparently unscripted action by Alsbury was taken just seconds into the flight of SpaceShipTwo when the suborbital space vehicle had reached the speed of sound, Mach 1 in the denser atmosphere at roughly 50,000 feet. However, unlocking the feathering mechanism was not followed by the second step – moving of another lever which actually rotates the twin tail sections relative to the fuselage to increase the drag for the feathering, which is like a shuttlecock effect. Two seconds after Alsbury’s action and the feathering, SpaceShipTwo experienced a catastrophic breakup. Feathering of the twin tail section of SpaceShiptTwo requires the pilots to execute two steps. The co-pilot Alsbury executed the first step — unlocking. According to the NTSB investigators, the unlocking of the mechanism should not have been enough to cause the feathering during the ill-fated test flight. The lock-unlock mechanism represents a safety feature. The feathering should only occur after the pilot moves a second lever which is not unlike the lever in a conventional aircraft that lowers the landing flaps to increase lift, but as with feathering, at the expense of adding more drag. Clearly this discovery by the NTSB is turning their focus away from the rocket engine which has posed so much difficulty for Scaled Composites project life cycle of SpaceShipTwo. The propulsion system has been primarily to blame for the delays which Virgin Group founder, Richard Branson has stated stands at five years; the project development now at the 10 year mark. 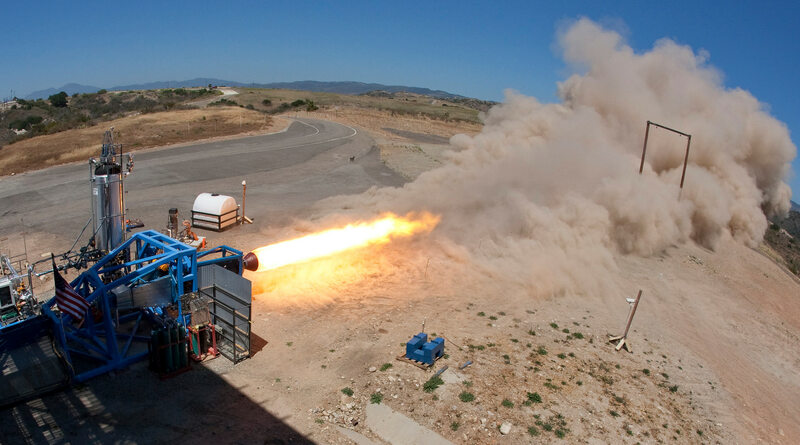 Discussions in the blogosphere involving aeronautic and propulsion experts and average citizens had quickly turned to criticism of the SpaceShipTwo rocket motor. However, review of the debris appeared to show the rocket motor intact. With this NTSB finding, there is likely to be a pause and change in the focus. However, if the NTSB investigation concludes that the feathering is the cause of the accident, this may not discharge the many concerns about safety of the SpaceShipTwo propulsion system design. 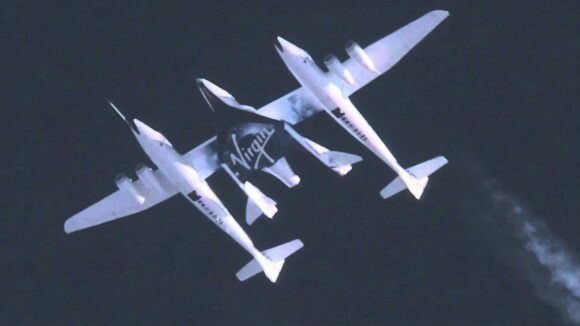 Virgin Galactic CEO Richard Branson responded harshly to the criticism of the propulsion system. “I’ve never seen such irresponsible innuendo and damaging innuendo,” he told Sky News television in the UK. “The fuel tanks and the engine were intact, showing there was no explosion, despite a lot of self-proclaimed experts saying that was the cause,” he said. 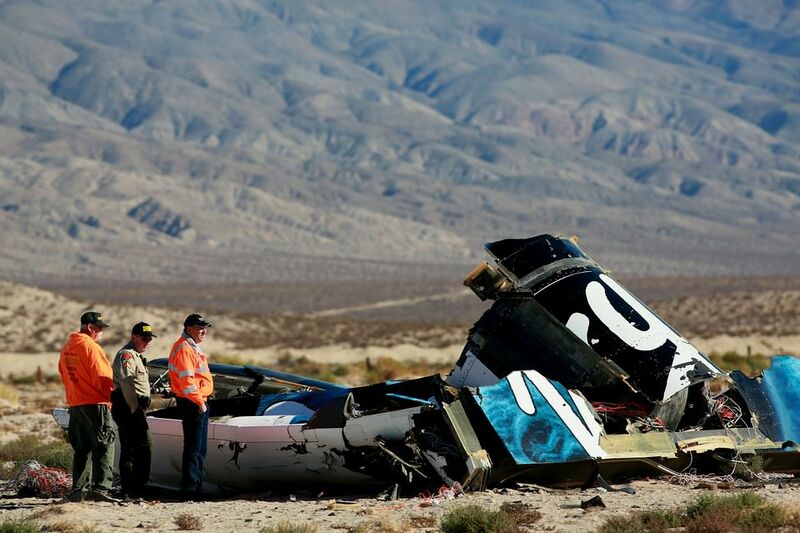 The SpaceShipTwo test flight accident occurred at 10:12 AM PDT on October 31st. One day later, NTSB agents had arrived in the Mojave desert to begin the investigation. During the first press conference, Hart stated that while the investigation is expected to last most of a year, he emphasized that the telemetry recorded during the flight was comprehensive and would be instrumental to uncovering a cause and effect. The telemetry included several video recordings from the carrier aircraft WhiteKnightTwo, from ground video cameras, and also from inside the cockpit. It is a review of the latter that showed the releasing of the feathering safety lock mechanism by Alsbury. Co-pilot Alsbury died as a result of vehicle’s breakup while the pilot, Peter Siebold, escaped or was thrown from the vehicle and parachuted to the ground. Siebold is in serious condition but conscious and speaking to family and attending physicians. Another point of comparison between the feathering of the SpaceShipTwo tail section with conventional aircraft flaps is that flaps are given a maximum speed at which they can be safely deployed. Deployment at beyond the maximum speed risks severe mechanical stress to the airframe. The feathering that occurred during the test flight at Mach 1 and at the low altitude of the early phase of powered flight by SpaceShipTwo would also have caused sudden and severe stress and potentially the breakup of the vehicle. NTSB’s Christopher Hart stated that a follow-up press conference would be held on Monday, November 3rd, and will provide more details regarding the NTSB discovery. Hart, during the Sunday press conference, reiterated that despite this early discovery, the investigation is still expected to take a year to conclude. Universe Today will follow with an update after the completion of the Monday press conference.